Author contributions: Gallagher SM and Selman SH contributed equally to the conception, research, composition and editing of this manuscript. Effective medications for the treatment of cancer were nonexistent in the early twentieth century. 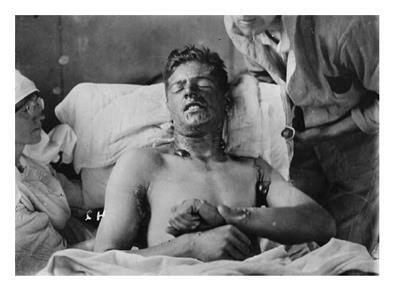 Ironically the widespread use of toxic chemical weapons, chlorine and sulfur mustard gas, during the “Great War” led to the first successful chemotherapeutic treatment of cancer patients. Soon after the introduction of poisonous gas on the battlefield, reports of the resulting pancytopenia in exposed combatants appeared in the medical literature. The biologic effect of chemical weaponry on rapidly dividing cells eventually was recognized for its salutary potential in the treatment of cancer. Once this potential was appreciated, hundreds of similar compounds were synthesized and evaluated as chemotherapeutic agents. One such compound, thioTEPA, would eventually open the era of intravesical treatment of urothelial cancer. Core tip: We attempt to outline the lineage of intravesical chemotherapy. Specifically, we look at its relationship to poisonous gas used in wartime and chronicle its journey to the bedside. While both the Allies and the Central Powers engaged in chemical warfare in World War I, it was the Germans who first developed an effective chemical weapon of mass destruction. The French tried tear gas, originally intended for riot control, but found it ineffective. The Germans also deployed tear gas and additionally experimented with sneezing powder. These early forays in gas warfare had little strategic effect. However, rumors of Allied research into more potent chemical weapons (subsequently proved untrue) spurred the Germans to develop more sinister chemical agents. Nobel laureate Fritz Haber would mobilize Germany’s scientific community and spearhead the development of new chemical weapons for the Central Powers. Of note, most of the belligerents in World War I had signed the Hague Peace Conference of 1899 that forbade “use of projectiles the sole object of which is the diffusion of asphyxiating or deleterious gases”. The Germans circumvented this clause by developing and then deploying chlorine gas batteries that were installed in front of their trenches, to be opened when a favorable wind could carry the gas towards the enemy. This system did not rely on “projectiles”and thus was not a violation of the Peace Conference. Such chlorine gas batteries were installed near the Belgian town of Ypres and were “fired” on April 22, 1915[1-3,5]. The weapon system’s code name was “Disinfection” and its use proved effective as it tore holes in the allied lines threatening total collapse. Within days of the attack, however, allied forces distributed gas masks neutralizing their toxic effects. 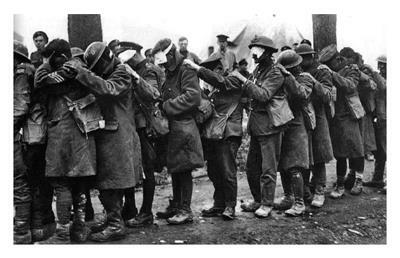 Gas masks proved insufficient protection against sulfur mustard gas (Figure 1), first used against British soldiers in July of 1917, as exposure damaged more than the respiratory tract. Mustard gas needed only to penetrate the combatant’s clothing for once in contact with the skin, it created chemical burns which blistered, ulcerated, and were slow to heal (Figures 1 and 2). Inhalation led to sloughing of the respiratory epithelia and pseudomembranous ulceration. Exposure often led to months of hospitalization. To this day, no widely effective antidote exists. Figure 1 A group of British soldiers blinded by a gas attack on April, 10 1918-From the collections of the Imperial War Museum in London, England. Figure 2 A Canadian soldier after exposure to mustard gas. Large bullae are present, especially where the fabric of his uniform doubled back on itself, allowing increased soaking of the compound into his clothing (at the armpit, shirt collar)-Obtained from Library and Archives Canada. Sulfur mustard gas, bis (2-chloroethyl)sulfide (Figure 3), was originally synthesized in the mid 1800’s by the French chemists Cesar-Mansuete Despretz and Alfred Riche. In 1860, the German chemist Alfred Nielmann first described its toxicity and in the same year the British investigator Frederick Guthrie remarked that “its smell...resembling that of the oil of mustard¡” resulting in its eponym. In 1886, the German chemist Victor Meyer described a more effective synthesis. Meyer noted that “the resulting oil is intensely poisonous, producing wounds that heal with great difficulty.” In 1913, British chemist Hans T Clarke improved upon Meyer’s synthesis. In 1915, while working in the laboratory of famed German chemist Emil Fischer, a flask of the compound inadvertently shattered resulting in Clarke sustaining chemical burns. The injury required two months of inpatient treatment to heal. Emil Fischer would subsequently propose sulfur mustard as a possible agent of warfare to Fritz Haber, a fact which Clarke attributed to his horrific accident. 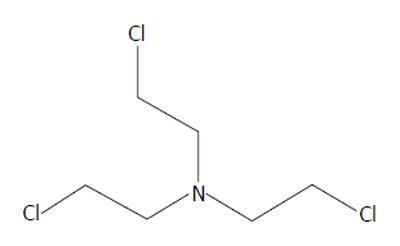 Figure 3 Bis(2-chloroethyl)sulfide, Sulfur Mustard. Soon after chlorine and mustard gas’ tactical introduction, military physicians began publishing reports on the injuries resulting from exposure. Combatants exposed to both gases often developed leukocytosis early in their clinical course[8-10]. The leukocytosis of sulfur mustard victims was characterized by immature white blood cell precursors and eventually developed into leukopenia[10,11]. The degree of leukopenia seemed to correlate with the severity of gas exposure and subsequent morbidity and mortality. Anemia developed concurrently with the leukopenia. Autopsies showed bone marrow depleted of white and red cell precursors[11,12]. Increased coagulation times indicated thrombocytopenia. It was clear from these findings that the bone marrow was particularly vulnerable. A generation later, in 1941, through their studies on chemically induced gene mutations in fruit flies, British geneticists Charlotte Auerbach and John Michael Robson demonstrated that mustard gas was directly mutagenic. Medical research into mustard gas was also underway in the United States during World War II. In 1946, Alfred Gilman and Frederick S Philips published a review article exploring the physiological effects of mustard exposure. In their review, the pancytopenia sustained by those suffering exposure was highlighted. The authors noted the chemical’s affinity for more mitotically active tissues. This paper was a preamble to another paper Gilman was soon to publish with colleague Louis Goodman. This subsequent study was to detail the first clinical use of the alkylating agents in the treatment of human cancer. As the name suggests, alkylating agents donate alkyl groups to other molecules, changing their structure and in the case of certain biologic molecules potentially disrupting their function. While sulfur mustard was the chemical weapon widely used in World War I, it would be nitrogen-based mustards (Figures 4 and 5) that would see clinical use. By covalently binding to DNA, the sulfur/nitrogen mustards are cytotoxic. Rapidly dividing cells are especially vulnerable[15,16]. Nitrogen mustard would also be shown to induce metabolic derangements at the cellular level, inducing lymphocytes to convert from aerobic to anaerobic metabolism. The specific mustards tested were bis(2-chloroethyl)methylamine (HN2), and tris(2-chloroethyl)amine (HN3). Both are hydrophilic and were dissolved in water for intravenous injection. Because the trial was conducted during wartime, the clandestine nature of the “medicine” resulted in designating the treatment agents as “compound X”. Patients had no understanding of the chemicals they were receiving. They were, however, desperate for treatment as their disease was refractory to the only treatment at the time, radiation. Yale surgeon Gustav Lindskog injected the first human with mustard chemotherapy in the early winter of 1942. In 1943 there followed a trial in which an additional 76 patients were entered. After the drug’s administration, patient’s symptoms resembled those of the exposed doughboys. They developed debilitating nausea and vomiting. Thrombophlebitis occurred at the drug injection sites. All experienced profound bone marrow suppression and several developed life-threatening pancytopenia, this occurring in a dose-dependent fashion. As the drugs suppressed the marrow, they also affected the malignancies that resided within. Patients with Hodgkin’s lymphoma, non-Hodgkin’s lymphoma, and assorted leukemias saw their tumors recede dramatically. Unfortunately malignancies recurred with resistance to the mustard alkylating agents. This trial’s success resulted in the establishment of chemotherapy as a viable treatment for human malignancy. However it was clear that toxicity and recurrence limited efficacy. Goodman and Gilman’s publication led to a flurry of research into HN2 and HN3 and stimulated a search for new alkylating agents. Molecules that bore structural resemblance to the mustards were explored. Triethylenemelamine (TEM) (Figure 6) was one such compound. 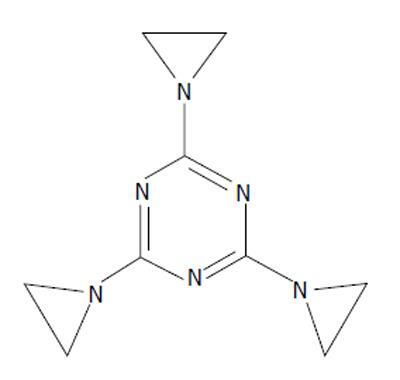 It contains aziridine groups, structures similar to the 3 membered rings that HN2 and HN3 display when they react. Two or more aziridine moieties were necessary for a drug to be biologically active[22,23]. Possessing three of these moieties, TEM was found to be efficacious against various mouse cancers[24-26]. TEM was shown to induce less nausea and vomiting than HN2 and patients tolerated higher doses. Like HN2 and HN3 before it, TEM went to human trial. Unlike HN2/HN3, intravenous administration of TEM caused no thrombophlebitis. TEM was also effective orally, making it possible to treat on an outpatient basis. Like HN2 and HN3 however, TEM was limited by its toxic effect on the bone marrow. Figure 6 Triethylenemelamine, 2,4,6-tris(aziridin-1-yl)-1,3,5-triazine, triethylenemelamine. 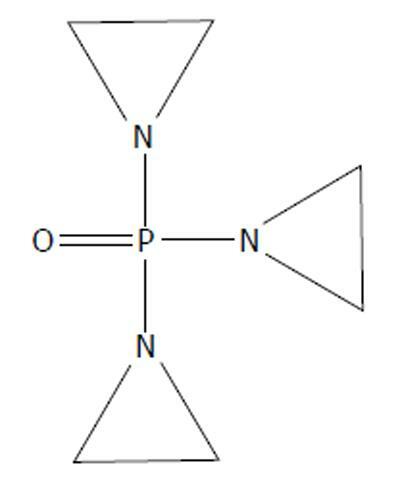 Other alkylating agents were examined, including triethylene phosphoramide (TEPA) (Figure 7). Like TEM before it, it was first found to be effective in treating cancer in various animal models[28-30]. Also like its cousin TEM, TEPA was tested in humans. Administration was possible intramuscularly. However, its clinical efficacy did not exceed that of HN2 or TEM[31,32]. 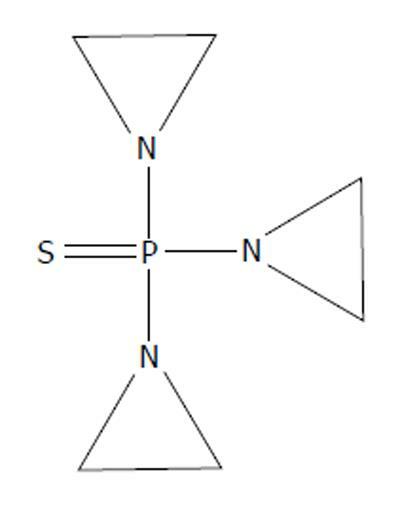 Figure 7 Triethylene phosphoramide, 1-[bis(aziridin-1-yl)phosphoryl]aziridine, triethylene phosphoramide . 1,1’,1’’-phosphorothioyltriaziridine (thioTEPA) (Figure 8), and its synthesis, were patented in 1952 by the American Cyanamid Company. It was intended for use in the textile industry and in the production of plastics. However, it went on to see heavy use in the medical field. It disrupts the functionality of nucleic acids like HN2 and HN3 before it. Similar to TEM and TEPA, thioTEPA contains aziridine moieties. ThioTEPA was entered into human trials in 1953 and was found effective against acute myeloid leukemia, chronic myelogenous leukemia (CML), and Hodgkin’s lymphoma, much like HN2, HN3, and TEM. Additional effectiveness was found in the treatment of HN2/TEM-refractory CML. Furthermore, it showed promising results in its use in two cases of adenocarcinoma of the breast. ThioTEPA produced no nausea or vomiting and was not associated with thrombophlebitis when injected intravenously. It was efficacious when injected intramuscularly and yielded no pain at the injection site. The first clinical trial noted a “reasonable margin for safety” between the apparent effective dose and undesired bone marrow suppression. Bateman’s intracavitary instillation of thioTEPA led to further studies using this technique. In 1957, HN2 was instilled into the urinary bladder as an adjuvant to surgical urothelial tumor removal. Another study would show that thioTEPA had little effect on surgical site healing. Since healing seemed to be unaffected, thioTEPA was thought to be ideal as an adjuvant to endoscopic bladder tumor removal. This tactic was first described in an article published in 1961 by HC Jones and John Swinney. At that time, these cases were typically managed solely endoscopically. The investigators described intravesical thioTEPA’s efficacy in treating smaller papillary tumors. In cases where multiple tumors would have precluded meaningful surgical management, lesion regression was sufficient such that endoscopic management of the disease became possible. Jones would publish another trial in 1963 that showed similar results. He would note that there were few side effects of intravesical thioTEPA treatment. Clinical use by Veenema demonstrated that bladder carcinomas of lower grade responded better to intravesical thioTEPA and that patients could be treated on an outpatient basis. He too coupled thioTEPA to surgical therapy and concluded that thioTEPA was especially useful perioperatively in cases in which the tumor hadn’t grown into the muscular layers of the bladder. He would later state that “The only real indication for topical agents is in the treatment of multiple superficial papillary tumors and for an attempt at prevention of recurrences.” Randomized control trials would confirm Veenema’s findings. ThioTEPA was clinically beneficial in reducing short-term recurrence in patients with stage I bladder carcinoma that were managed endoscopically[48-50]. Other intravesical agents are available today of which mitomycin C, an intercalating compound, is widely utilized. It was tested in Japan in the mid-70s and showed efficacy similar to that of intravesical thioTEPA. Following initial trials, some reports suggested that mitomycin C was more effective than thioTEPA[52,53]. But, the proposed increased efficacy would turn out to be minimal. Much of the later, definitive research showed the two to be generally equally efficacious in preventing short term recurrence. Combined with its increased cost, the Urologic community had little reason to switch to mitomycin C in the early years. It was, however, useful in treating patients with carcinoma refractory to thioTEPA. Today, mitomycin C is often used instead of thioTEPA because it undergoes less systemic absorption from the bladder. thioTEPA’s smaller size allows for potential, significant leukopenia following its introduction. Because of these concerns, Mitomycin C has by-and-large replaced thioTEPA as the preferred intravesical chemotherapeutic. Of all the available intravesical chemotherapeutics, no single agent has clearly demonstrated increased efficacy[58-60]. These agents are primarily used in cases of low-grade disease in conjunction with endoscopic ablation because all have been found to be ineffective in preventing long-term recurrence and are thus most appropriate in treating lesions that are at low risk of progressing. Intravesical immunotherapy followed the chemotherapeutics. The anti-tuberculosis vaccine agent Bacillus Calmette-Guérin (BCG) has been found to be the most effective of these agents. Its mechanism of action is believed to work by inducing a T1 cellular response in the bladder wall, in which recruited immune cells target the neoplastic tissue. Maintenance BCG has been demonstrated to prevent long-term disease recurrence and additionally is effective against higher grade disease. Because it is an attenuated mycobacterium, it can be life-threatening in immunocompromised patients. It can induce intense hypersensitivity responses in the immunocompetent patient. Currently, intravesical chemotherapeutic agents maintain their role in the management of carcinoma of the bladder, specifically in treating low-grade disease that has little risk of progression[59,60]. Since their introduction as weapons of mass destruction, alkylating agents have transformed the prognosis for patients suffering from a number of malignancies including bladder cancer. In particular they led to the clinical use of chemical agents for intravesical chemotherapy. The history of their development from poisons to potent antineoplastic agents fulfills the biblical dictum “...and they shall beat their swords into plowshares and their spears into pruning hooks....”.